Ayumi Yoshida (吉田 歩美 Yoshida Ayumi), also known Amy Yeager in the english Funimation dub, is a character in the manga and anime franchise Detective Conan. 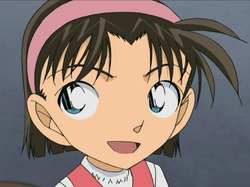 Mitsuhiko Tsuburaya is a student in Teitan Elementary when Shinichi joins his class as Conan Edogawa. Shortly afterwards, his classmates Ayumi and Genta have the idea of investigating an apparently haunted mansion, and they persuade Conan to come along. When Mitsuhiko expresses his skepticism about supernatural hauntings, Genta forcefully 'persuades' him to tag along as well. As it turns out, the haunting is a cover-up for an old homicide case. Genta Kojima (小嶋 元太 Kojima Genta), also known as George Kaminski in the Funimation dub, is a character in the manga and anime franchise Detective Conan. Genta Kojima is a student in Teitan Elementary when Shinichi joins his class as Conan Edogawa. Shortly afterwards, he and his classmate Ayumi decide to investigate an apparently haunted mansion, and they persuade Conan to come along. When their friend and classmate Mitsuhiko expresses his skepticism about supernatural hauntings, Genta forcefully 'persuades' him to tag along as well. As it turns out, the haunting is a cover-up for an old homicide case. 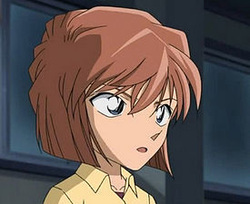 Ai Haibara (灰原 哀 Haibara Ai), real name Shiho Miyano (宮野 志保 Miyano Shiho), is the inventor of the APTX 4869 poison that shrunk Shinichi Kudo into Conan Edogawa, and a victim of the poison herself. Formerly Sherry (シェリー ) of the Black Organization, she is on the run from them and lives with Professor Agasa. She is also one of few characters who knows Shinichi is Conan.